The Lord has a special interest in the patriarch, who holds a unique position in the Church. Fifty-eight years ago, I knocked on the door of J. Roland Sandstrom, patriarch of the Santa Ana California Stake, with a recommend from my bishop to receive a patriarchal blessing. We had never met and would not meet again for 14 years. We met again 15 years later. This time, as one of the Twelve, I blessed him the day before he died. The blessing was delivered by mail to my barracks at an air force base where I was stationed. I did not know then, as I know now, that a patriarch has prophetic insight, that his blessing would be more than a guide to me. It has been a shield and a protection. The father is a patriarch to his family and can and should give father’s blessings to his children. Until a few years ago, every stake patriarch was called and ordained by a member of the Quorum of the Twelve Apostles. When the number of stakes increased, this responsibility was delegated to the stake president. Like the other offices in the Melchizedek Priesthood﻿—elders, high priests, Seventies, and Apostles﻿—the stake patriarch is ordained rather than set apart. The stake president submits a name to the Quorum of the Twelve Apostles. Each name is carefully and prayerfully considered. Once approved, the patriarch is sustained in stake conference, then ordained. He then, with prophetic insights, will pronounce blessings upon the heads of those who come recommended by the bishop of their ward. We now ask each stake president and each patriarch to reread this brief document. Read it more than once. Patriarchs do not advertise for blessings. Members should seek blessings as they feel inspired to do so. There is no fixed age at which one may receive a patriarchal blessing. The bishop ensures that the member is of sufficient age and maturity to understand the meaning and significance of the blessing. A patriarchal blessing is recorded and transcribed by one who is assigned by the stake president. That blessing becomes a very personal treasure. Except for members of the immediate family, we should not permit others to read our blessing nor should we ask others to interpret it. Neither the patriarch nor the bishop can or should interpret it. When the Twelve called and ordained patriarchs, we shared experiences. We learned the Lord has a special interest in the patriarch, who holds a unique position in the Church. I recall a conference where the patriarch was very old. While his ordination would remain in force, it was time that he be excused from giving blessings. The stake president recommended a man with much leadership experience. However, I did not get the feeling that he should be the patriarch. As the evening meeting was about to begin, an older man came partway down the aisle and, unable to find a seat, went to the back of the chapel. He was not quite as well dressed as most of the others and obviously had spent much time out-of-doors. As I recall, he had six sons and one daughter. The youngest was then serving a mission, as had his older brothers, who were married and scattered about the country, all serving faithfully in the Church. “What about your daughter?” I asked. When I named the man, he was startled and said, “Isn’t that interesting! I saw him among the people, coming into the building, and said to myself, ‘Wouldn’t he make a wonderful patriarch?’” It was an inspiring confirmation from the old patriarch. There is nothing like this office in all of the Church or in all of the world. Stake presidents must provide very careful, special watch care over the patriarch. You should have him sit on the stand and be recognized. On regular occasions, perhaps twice a year, you should interview the patriarch and read some of his blessings. Remind him that each blessing should be individual and special to the member. The periodic reading of blessings must not be neglected by the stake president. I once ordained a patriarch who was overcome with the responsibility. For months he could not get himself to give a blessing. Finally, he asked his stake president if he might write a paragraph as a model introduction to any patriarchal blessing. The stake president approved. An essential part of a patriarchal blessing is the declaration of lineage. By careful study of the scriptures, a patriarch becomes familiar with the patriarchal order. He learns the destiny of the tribes of Israel. The Brethren have taught: “In giving a blessing the patriarch may declare our lineage﻿—that is, that we are of Israel, therefore of the family of Abraham, and of a specific tribe of Jacob. In the great majority of cases, Latter-day Saints are of the tribe of Ephraim, the tribe to which has been committed the leadership of the Latter-day work. Whether this lineage is of blood or adoption does not matter (Pearl of Great Price, Abraham, 2:10). This is very important, for it is through the lineage of Abraham alone that the mighty blessings of the Lord for His children on earth are to be consummated (Gen. 12:2, 3; Pearl of Great Price, Abr. 2:11). Since there are many bloodlines running in each of us, two members of one family might be declared as being of different tribes in Israel. A patriarch may give patriarchal blessings to his own children, grandchildren, and great-grandchildren who come recommended by their bishop. When we receive requests for exceptions, for one to receive a blessing from an uncle or some favorite family friend, we invite them to follow the order and receive their blessing from the patriarch in their own stake. In mission districts or in stakes where there is no patriarch, members may receive a recommend from their bishop or branch president to a patriarch in an adjoining stake. Occasionally a member may feel that their blessing is somewhat less than expected. But as time goes on, they will recognize the power of revelation in it. Sometimes someone will worry because a promise made in a patriarchal blessing is not yet fulfilled. For instance, a blessing may indicate that a member will be married, and they do not find a companion. That does not mean that the blessing will go unfulfilled. It is well to know that things happen in the Lord’s due time, not always in ours. Things of an eternal nature have no boundaries. From the premortal existence to our existence beyond the veils of death, our life is an eternal life. Circumstances, such as advancing age and infirmity, moving out of the stake, or a call to serve a mission, may require that the stake president recommend to the Quorum of the Twelve Apostles that the patriarch be honorably excused from active service. President Harold B. Lee told of calling a patriarch. He and the stake president had gone to the man’s home. He had been out with his sons on the welfare farm all day and was tired and weary and covered with grime. After the morning session of conference, where the man had borne a remarkable testimony, they went to a basement office. The stake president’s wife was present and wrote to President Lee: “As you walked over to put your hands on [his] head, I thought to myself, He is a man with whom we socialize. We have gone on trips with him, to dances. … Now part of his responsibility is to declare the lineage from which each one has come in these blessings. He hasn’t been a student of ancient languages﻿—how is he going to know? And so it must be. Whenever a patriarch is ordained or pronounces a blessing, that same light, though it may be unseen, is present. It empowers a patriarch to declare lineage and to give a prophetic blessing, notwithstanding that he himself may be a man of very ordinary capacity. Do not let the office of stake patriarch be neglected or ignored. It is essential to the spiritual power of a stake. Now, to stake presidents, watch over the work of your stake patriarch. Keep him close to you. Interview him and read selections from his blessings. And speaking to the patriarchs, you have been chosen as few other men are chosen. You must live in such a way that through spiritual inspiration, you can give prophetic and inspired blessings. Be an exemplary patriarch in your own family. Live to be worthy of the Spirit. And experience the joy of your calling. The patriarch, who had never seen me before, made a promise that applies to every one of us. He told me to “face toward the sunlight of truth so that the shadow of error, disbelief, doubt and discouragement shall be cast behind you.”9 Many times I have gained strength from reading that patriarchal blessing given by an inspired servant of the Lord. I bear witness that this is a holy office, a sacred office, a blessing to this Church, that it is an example of the blessings that the Lord has established in His Church for the blessing of all of us. And I bear testimony of Him in the name of Jesus Christ, amen. Teachings of the Prophet Joseph Smith, sel. 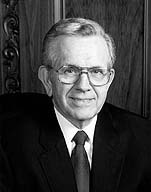 Joseph Fielding Smith (1976), 151. Adam counseled and blessed his posterity (see D&C 107:42–56); Jacob blessed his sons and their descendants (see Gen. 49:1–28); Lehi blessed his posterity (see 2 Ne. 4:3–11). The Savior ordained apostles, prophets, and evangelists (see Eph. 4:11); the duty of the Twelve is to ordain evangelists (see D&C 107:39); Hyrum Smith was to take the office of patriarch (see D&C 124:91–92, 124; D&C 135:1). First Presidency letter, 29 June 1903; see also James R. Clark, comp., Messages of the First Presidency of The Church of Jesus Christ of Latter-day Saints, 6 vols. (1965–75), 4:57–58. Harold B. Lee, Stand Ye in Holy Places (1975), 117. John A. Widtsoe, Evidences and Reconciliations, 3 vols. (1943–51), 1:73–74. The Teachings of Harold B. Lee, ed. Clyde J. Williams (1996), 488–89. Patriarchal blessing of Boyd K. Packer, 15 Jan. 1944, 2.